From time immemorial, or 1998 to be less dramatic, the Audi TT has been the go to sportscar for all manner of wealthy aunties and spoilt daughters. It had the swoopy design that screamed 'look at me!' but was easy enough to drive to prevent being, 'look at me as I crash into this tree'. It was the type of car that would make you go aww and want to pinch its chubby little wheel arches. Naturally then the TT wasn't a car I cared for much because I simply couldn't take it seriously as a sportscar. It was too cute for that. This one thankfully starts off on the right foot because that new face looks strikingly good. It's much closer to the new R8 and so much better for it. Naturally Audi wouldn't want to mess too much with such a successful formula so both the side and rear are sharper but cut the same profile. I do like the new wheels and love how the rear spoiler neatly integrates into the boot. There's also a thin LED line that connects both tail lamps and looks fabulous when it lights up under braking. On the unflattering side is a rather ugly kink in the side skirt towards the rear and I also think that the wheel arches are unnaturally steroided up. Granted, this is a TT trademark but maybe after 17 years its time to try something a little different? Things only get better when you step inside the minimalist but luxurious cabin. It may be a four seater but I don't see anyone spending more than a few minutes in the super tight rear. 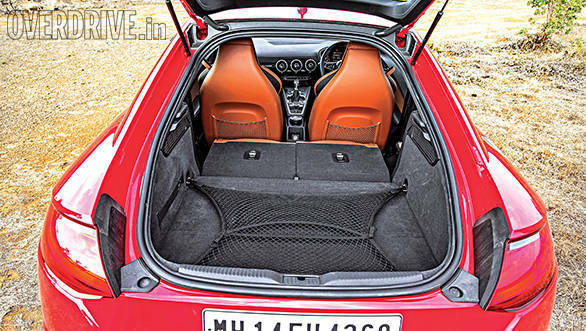 But then you can drop the rear seats flat to liberate a huge amount of space that will embarrass many a hatchback. However, what you notice is that this cabin is one hell of a tech fest. 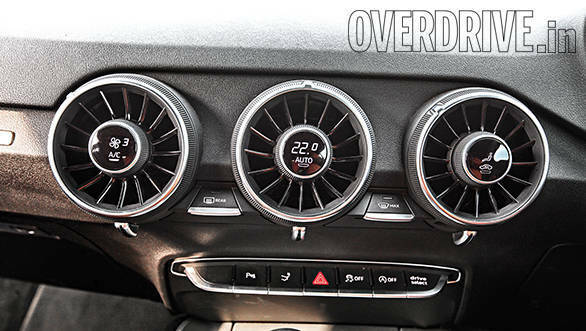 Take the air vents for example. Each of the three circular pods has a small display to handle temperature, blower speed and mode functions. The vents themselves don't move but a twist at the circumference rotates vanes inside to change the direction of airflow. They can be toned down or closed via a small tab at the base. Then you'll discover that there's no display on the dash despite the fact that the traditional MMI wheel and buttons reside behind the gear shift lever. 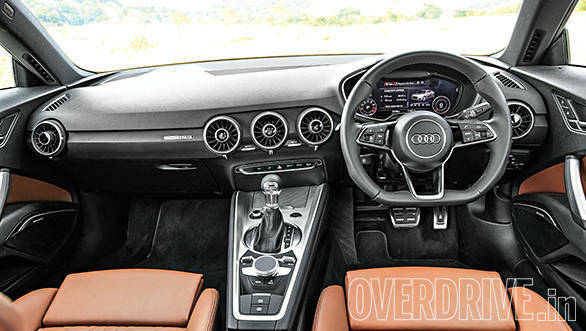 And that's where the TT's biggest party trick comes out - that awesome new high resolution digital instrument cluster. What starts off as a perfectly normal set of dials also doubles up as a replacement for the screen that should be on the dashboard. 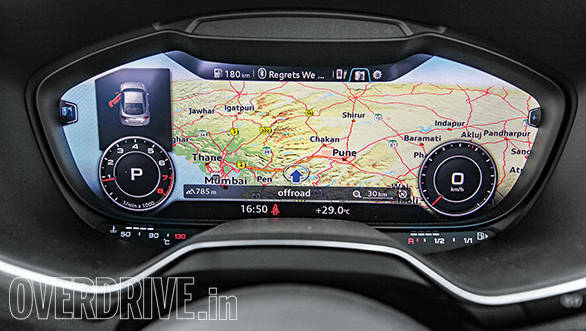 This means that you can access and control all the car's parameters including settings menus, the infotainment system, trip computer and even navigation. Further you can have the speedo and rev counter in regular size or they can be reduced to smaller dials on either side of the screen to make it easier to browse through menus. More good news is that the navigation uses Google Earth and Street View to make the entire experience of navigation three dimensional, intuitive and effective. But best of all is that everything can be controlled by just the five controls on the left side of the wheel if you don't feel like using the MMI controls. The system works surprisingly well, especially in a driver focussed car like this but it will be interesting to see if the same technology arrives in more conventional future Audis. But wait, there's more. 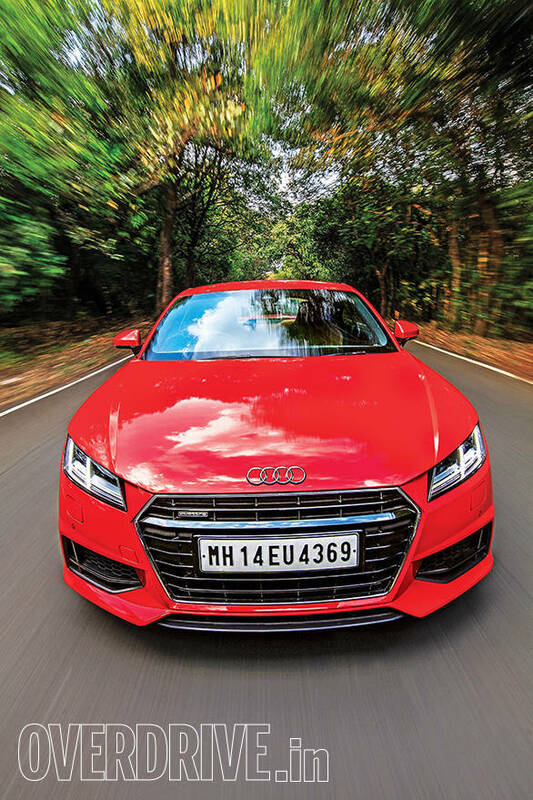 The TT is the second Audi in India to feature Audi's state of the art Matrix LED auto high beam technology and they seem to work even better here than in the A8. On a road like the Mumbai-Pune Expressway, you can see the headlamps constantly looking for sections of darkness to illuminate with pops of bright white light. It doesn't just look out for oncoming vehicles but even recognises tail lamps and you can see it dim the beam so as to not blind the driver ahead while keeping the rest of the road bathed in light. This marvelous technology works even in our chaotic conditions and is a joy to watch in operation - don't let it distract you though. Further pleasure comes in the interior reading lamps that require a light brush of a finger to turn on and off, a technology that Jaguar pioneered but we nonetheless enjoyed in the little Audi. Finally, we arrive at the driving experience. Let's start with the engine which is the same 2.0-litre turbo petrol as the last generation car but tuned for more power - 230PS over the old 211. Performance is brisk with power going to all four wheels via a 6-speed DSG which offers sharp downshifts but has the slightest of hesitations while shifting up. The exhaust however is throatier than before with a nice raspy note and also generates a pop on full bore upshifts. Drive Select allows you to tune the sound via a butterfly valve in the left exhaust but we found that it makes almost no difference - adding just a hint of extra bass. A launch control aided start results in a 6.1 second run from 0-60kmph while top speed is a claimed 250kmph. Cruising at 180kmph is unstressed and has the tacho just below 3,500rpm. A start stop system and a coasting function when in Efficiency mode helped return a fairly decent 9.4kmpl overall figure. When it comes to ride and handling the TT on its new MQB chassis is quite the curiosity. At low speeds on these 18-inch rims it feels just as you'd expect - firm like a sportscar. Things should improve if you opt for the smaller 17-inch wheels but with care over potholes and speed breakers the car is actually very usable. Its compact, has good visibility, usable ground clearance and a turning radius almost identical to a Hyundai i20. 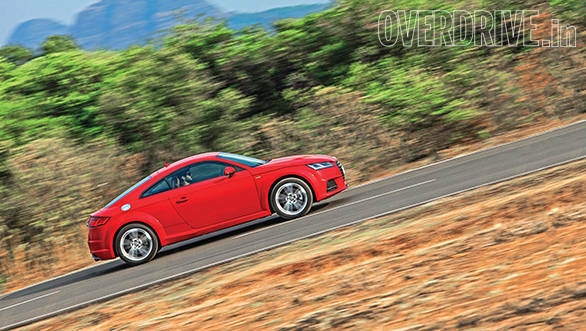 On a smooth road like the one to Aamby Valley, there's plenty of fun to be had chucking the sticky little TT around. 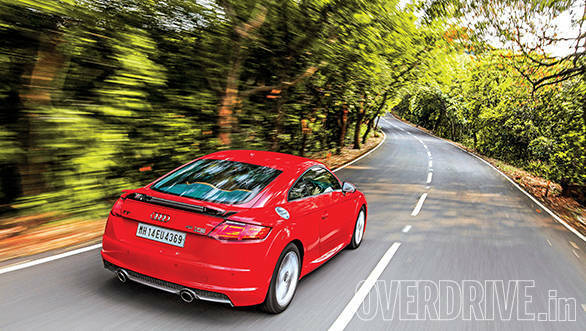 Interestingly, as speeds rise on undulating surfaces like the expressway, the TT begins to feel mushy. Here, when you push it, the TT starts to feel a little soft and tends to lean on the side with more weight. Enter a right hander hard and you can feel the car lean on the front left or hit a small depression while exiting the corner and you feel the weight move to the rear left. Essentially, there's huge grip on offer thanks to all-wheel drive but it comes with some body roll. Since the car doesn't have adjustable suspension as standard (as of now we're not sure if the optional magnetic dampers will be offered in India) there's not much you can do about the ride. Also not very nice is the new electric steering that's typically Audi - light and precise but stony silent in terms of telling you what's happening under the wheels. The new TT excited me a lot more than I was expecting it to. But that wasn't entirely down to the way the car drives. 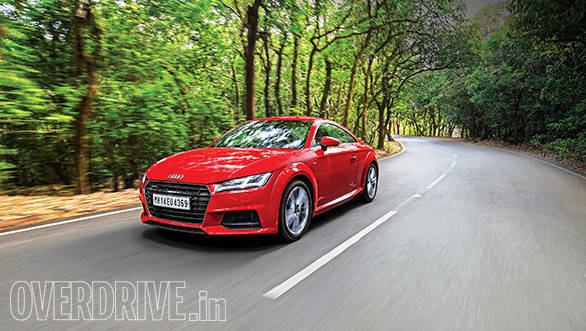 In that sense the TT retains its identity - it is approachable, usable and fast enough to quicken the pulse but also far from the ultimate small sportscar. To be fair that was never its intention and the TT will be the perfect car to customers who are looking at its particular set of skills. No, the reason why I was so kicked with the TT is that it is without a doubt, technologically far ahead of every other car I have driven in terms of the user experience. So much thought has gone into the design, hell there's even a little slot to store the key so it doesn't clatter around. But it is features like those incredible Matrix headlamps and the new trick digital instrument cluster that really drives the point home. We've often moaned about how cars need to become more intuitive to use, like our cellphones, and this is a big step in the right direction. So there you have it. The new Audi TT is a nice little sportscar. But it is a hugely amazing experience.